Journal of Clinical Diagnosis and Treatment is a quarterly, peer-reviewed, open access journal for scientific community to share their knowledge and research to students, teachers, and medical societies or associations globally. Journal of Clinical Diagnosis and Treatment represents wide range of research on diseases, associated disorders, and their treatment for well-being of humans. 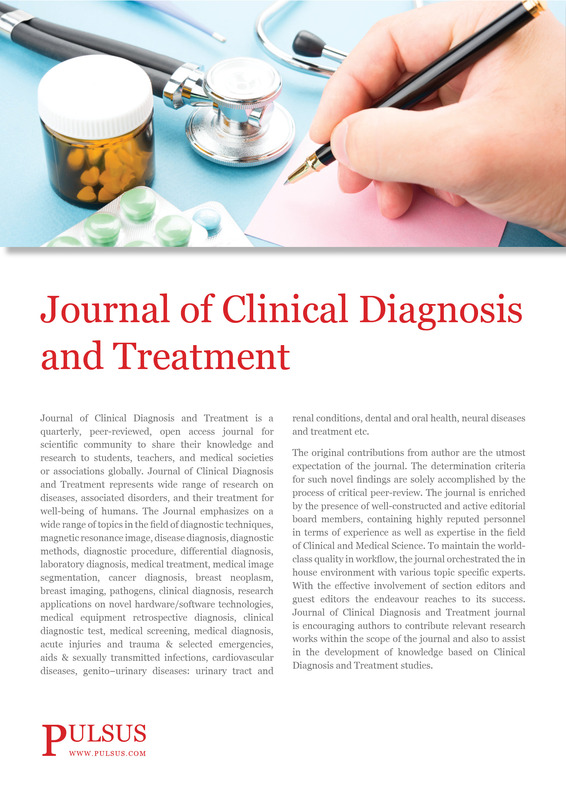 The Journal emphasizes on a wide range of topics in the field of diagnostic techniques, magnetic resonance image, disease diagnosis, diagnostic methods, diagnostic procedure, differential diagnosis, laboratory diagnosis, medical treatment, medical image segmentation, cancer diagnosis, breast neoplasm, breast imaging, pathogens, clinical diagnosis, research applications on novel hardware/software technologies, medical equipment retrospective diagnosis, clinical diagnostic test, medical screening, medical diagnosis, acute injuries and trauma & selected emergencies, aids & sexually transmitted infections, cardiovascular diseases, genito−urinary diseases: urinary tract and renal conditions, dental and oral health, neural diseases and treatment etc. The original contributions from author are the utmost expectation of the journal. The determination criteria for such novel findings are solely accomplished by the process of critical peer-review. The journal is enriched by the presence of well-constructed and active editorial board members, containing highly reputed personnel in terms of experience as well as expertise in the field of Clinical and Medical Science. To maintain the world-class quality in workflow, the journal orchestrated the in house environment with various topic specific experts. With the effective involvement of section editors and guest editors the endeavour reaches to its success. Journal of Clinical Diagnosis and Treatment journal is encouraging authors to contribute relevant research works within the scope of the journal and also to assist in the development of knowledge based on Clinical Diagnosis and Treatment studies. Author may submit their manuscripts through the journal's online submission and tracking system which is located at http://www.editorialmanager.com/pulsus/default.aspx or as an e-mail attachment at [email protected] to editorial office.